With the new release (1.02) of finaquant® protos we decided to offer most of the interface elements like the DataTable class of .net framework that connect MatrixTable class of finaquant to the outside world as free and open-source (C# code). Beginning from today (5. 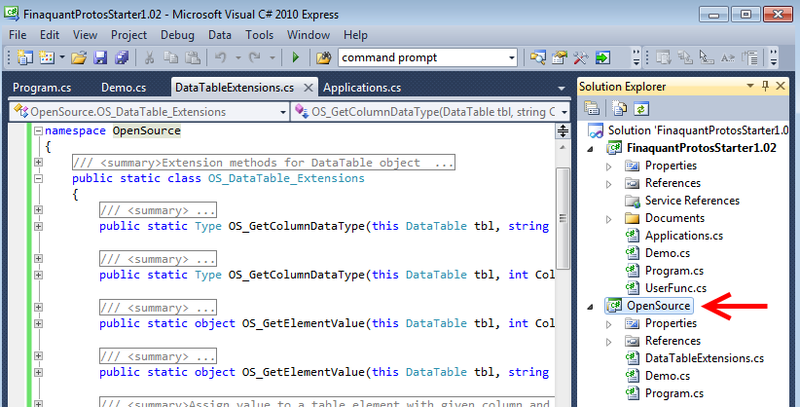 Feb 2013) you may download our DataTable extensions together with the MS Visual Studio project FinaquantProtosStarter which also contains demo functions for finaquant® protos. Users with developer skills: Feel free to change and use the code wherever you want. We would appreciate if you inform us about your suggestions and improvements at our forum for general topics. Other users without time or skill for software development need not bother at all about the additional project OpenSource within FinaquantProtosStarter; they can as usual focus on demo functions for analytical table functions. // Convert TableMatrix to DataTable. // Save DataTable as an XML file. #region "Create a test table of type MatrixTable"
#endregion "Create a test table of type MatrixTable"
string directory = @"C:\Windows\Temp\";     // check if this is a valid directory on your computer! This entry was posted in Calculation engine and tagged .net library, c#, DataTable. Bookmark the permalink.